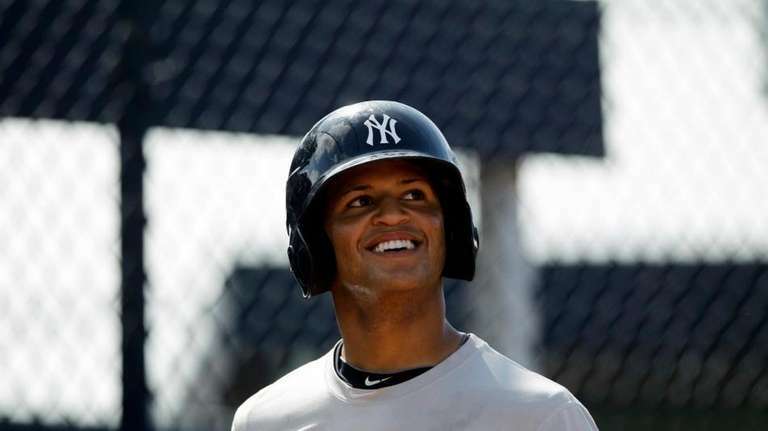 The Yankees didn't just call up former top prospect Mason Williams for his first taste of the big leagues Thursday. They called him up with the intention of giving him a serious look in the lineup until Jacoby Ellsbury returns from the disabled list. Williams, a 23-year-old lefthanded hitter, will play centerfield against righthanders with Brett Gardner shifting to left, general manager Brian Cashman said. Williams was rated as the Yankees' No. 1 prospect as recently as 2013, but had failed to live up to the hype. Added to the 40-man roster before this season, Williams has re-emerged by batting a combined .318 at Double-A and Triple-A. "His performance has been great," Cashman said in a telephone interview. "He's always had a lot of physical tools and the performance hasn't followed for about two years now. But again, when you have the physical tools and when the mental and the physical come together, you can move fast. And he obviously has moved fast now." With closer Andrew Miller going on the 15-day disabled list Thursday with a strained forearm muscle, Cashman could have immediately recalled Ramon Flores, who like Williams is a lefthanded-hitting outfielder. Flores was sent down before Wednesday's game after getting three hits on Tuesday. But Cashman chose Williams instead. "Obviously, Mason can play center," Cashman said. "He's a better defender. So he'll have the same opportunities that Flo had. He'll be in against righthanded pitching in center and you put Gardy in left." In 2014, Williams seemed stalled as he hit .233 for Double-A Trenton after years of struggles. But the Yankees chose to protect the 2010 fourth-round pick on the 40-man roster instead of exposing him to the Rule V draft. This year, Williams hit .317 with a .782 OPS for Trenton and .321 with an .814 OPS for Triple-A Scranton/Wilkes-Barre. Combined, he had 14 doubles, one triple, no home runs and 13 stolen bases in 20 attempts. Ellsbury is not expected to return from his knee injury anytime soon, thought he is said to be progressing. It's hard to imagine the Yankees keeping three speedy lefthanded-hitting outfielders without much power in the lineup when Ellsbury does return, so Williams may also be showcasing his talents for other teams if the Yankees want to make a trade once they are whole. But for now, Williams will get a chance to show he belongs. "It's all coming together for him," Cashman said, "so he moved from Double-A to Triple-A. Everybody you talk to says, 'This is the guy who could be a factor for you at the major-league level if and when you need to take a look at that.' "
Notes & quotes: Cashman said the quickest Miller could return would be three weeks. "It's a timing issue," he said. "The concern is not having him. It's a period of down time that you just have to give it time to heal. That's it." . . . The Yankees called up righthander Chris Martin to replace Miller. Martin had a 3.55 ERA in 15 appearances for the Yankees before going on the DL with an elbow injury. . . . The Yankees traded righthander David Carpenter to the Washington Nationals for minor-league second baseman Tony Renda. Carpenter had been designated for assignment on June 3.